A team of Frankfurt-based archaeologists has returned from the Iraqi-Kurdish province of Sulaymaniyah with new findings. The discovery of a loom from the 5th to 6th century AD in particular caused a stir. The group of Near Eastern archaeology undergraduates and doctoral students headed by Prof. Dirk Wicke of the Institute of Archaeology at Goethe University were in Northern Iraq for a total of six weeks. 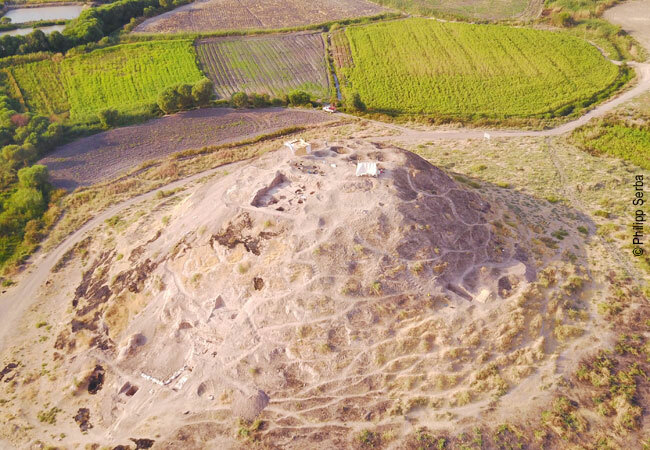 It was the second excavation campaign undertaken by the Frankfurt archaeologist to the approximately three-hectare site of Gird-î Qalrakh on the Shahrizor plain, where ruins from the Sasanian and Neo-Assyrian period had previously been uncovered. The region is still largely unexplored and has only gradually opened up for archaeological research since the fall of Saddam Hussein. However, the archaeologists had not expected to find a Sasanian loom (ca. 4th-6th century AD), whose burnt remnants, and clay loom weights in particular, were found and documented in-situ. In addition to the charred remains, there were numerous seals, probably from rolls of fabric, which indicate that large-scale textile production took place at the site. From the neo-Assyrian period (ca. 9th-7th century BC), by contrast, a solid, stone-built, terraced wall was discovered, which points to major construction work having taken place at the site. It is possible that the ancient settlement was refortified and continued to be used in the early 1st millennium BC. Work on the project was initiated by Prof. Wicke in 2015 with support from the local Antiquities Service as well as the Enki e.V. association situated at Goethe University and the Thyssen Foundation. Work is set to continue next year depending on further funding and the political development in the Iraqi-Kurdish region.